Which speakers should I get for my hi-fi? As you've probably already noticed, there's a lot of choice out there when it comes to speakers. They're available in all sorts of shapes and sizes, but you can narrow your options down pretty quickly. Firstly, how big do you want them to be? Larger speakers will generally be able to produce deeper bass and more impact, but that's all moot if you can't fit them in. 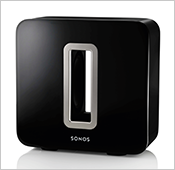 Very small speakers can produce impressive results, but usually only in conjunction with a subwoofer, which you'll need to take into account. It's also a case of where you want them to go. Some speakers don't work very well wall-mounted for example, and bookshelf speakers will always sound their best on dedicated stands. Don't feel bad to judge on appearances, either - if design is important narrow it down that way. Once you've reduced your options, your best bet is to book a demo! After all, if the size is right and they look great, but you don't like the sound, there's no point buying them! You'd be forgiven for thinking that a subwoofer is a device used solely by boy racers to impress their mates, but they can be used to effectively enhance the performance of any sound system, especially if you watch a lot of movies. Obviously if you're after dramatic bass punch it's the best way to go, but a subwoofer will underline everything you listen to with extra definition, making the rhythm easier to follow for a more toe-tapping performance. Movies use something called LFE (Low Frequency Effects) to add depth and power to the sound. It's not all about explosions - sounds like thunder or the roar of an engine all sound more believable. If you don't have a sub then your receiver will automatically play these effects through your main speakers, but then you lose the extra depth that comes with a dedicated bass box. 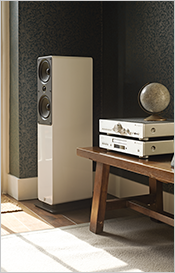 Many argue that in an ideal system you shouldn't be able to tell that you have a separate subwoofer, it should seem like everything is coming out of your main speakers, augmenting their performance for the last word in sound quality. Achieving this effect means careful matching and this is where our sales advisors will help you find the right combination for you. You can even have a listen in our demo rooms before you buy! 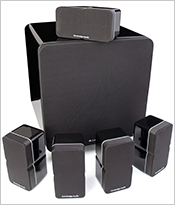 What makes a good surround sound speaker package? In a typical 5.1 system, two main speakers are placed front left and right, there’s a centre speaker for dialogue, and two rear channels for surround sound effects, plus the subwoofer for low frequency grunt (that’s the .1). For the surround channels, full-size box speakers provide more action, oomph and bass throughout the sound field – they’re ideal for larger rooms or serious home cinema. For those with smaller living spaces or who don’t want rooms dominated by speakers, smaller satellite speakers are more discreet, and still pack more of a punch than soundbars or the speakers in your TV, but they rely more heavily on the subwoofer for bass notes than traditional box speakers. Of course, with Richer Sounds, it’s your choice and we’ll help talk you through your options. You can even mix and match – with full-size front left and right box speakers for great big-screen action and stunning stereo music, but smaller and more discreet satellite speakers for centre and rear channels.